What better way to start the day than sipping whiskey straight from the barrel? 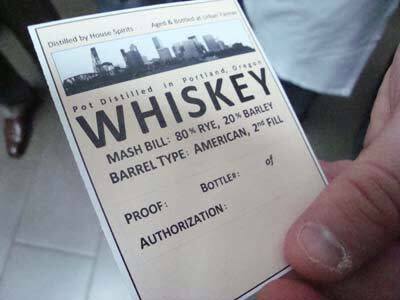 I snagged an invite this morning to witness (and sample) some of the House Spirits-distilled whiskey that will be available exclusively at Urban Farmer, the spiffy steakhouse on the eighth floor of the Nines Hotel. 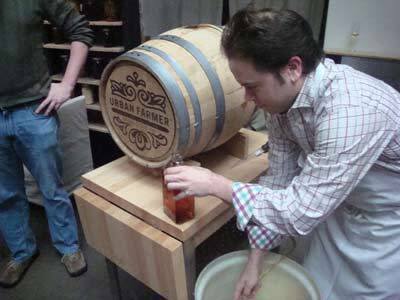 Lee Medoff from House Spirits and Dan Stern, the head bartender at Urban Farmer, fielded my inane questions while tending to the business of tapping a 15-month-old barrel and bottling its potent contents for the restaurant’s discriminating clientele. Medoff was the chemist in charge, dutifully adding water to the mix to arrive at a suitable proofage. We also passed around some of the “white dog” or moonshine that’s on the Urban Farmer menu, which is a lively clear spirit; essentially whiskey that hasn’t been aged at all. Both intern Robert Runyon and I found the elixir surprisingly easy to drink, with a strong floral profile. After several tastes (I lost count—and subsequently got lost looking for the elevator) of whiskey from different types of barrels (new American, new French, and second-filled American), I’m floored that so much of the whiskey’s aroma, mouth-feel, and flavor comes directly from the wood and nothing else. There are no additives in this mix: It’s all just hooch + barrel + time = smooth, delicious whiskey with a number of intriguing taste characteristics. Normally, the Urban Farmer is a wee bit out of my price range (OK, it’s way out of my price range) but I’m going to put on my thinking cap and devise some ingenious way to become a regular. At least at the bar.